Spruce up an old commode with this attractive porcelain knob from La Finesse. 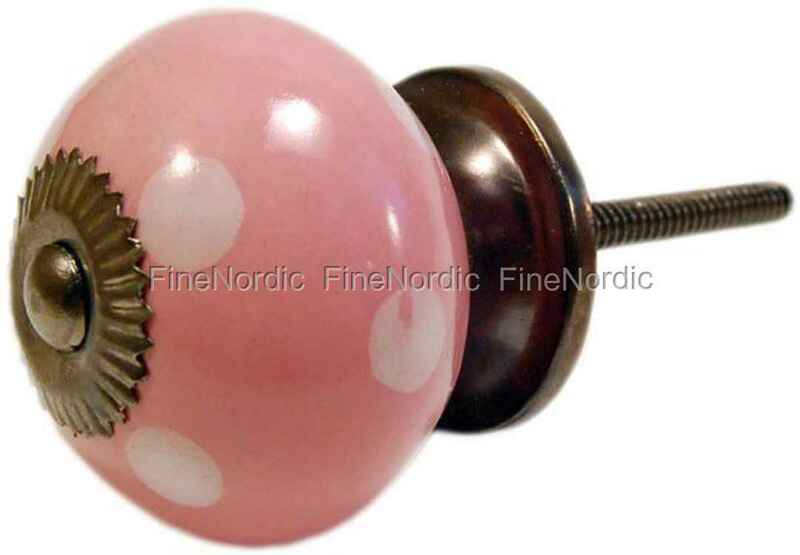 This round pink knob with white dots can completely change the appearance of a piece of furniture and it does it in an easy and inexpensive way. Opening or closing a drawer or door is child’s play, once this nostalgic knob is attached. The knob has a diameter of 4 cm and once it’s fastened it will stick out about 4,1 cm from the door or drawer. If you want to change the look of more than just one piece of furniture, then please check out at all the other knobs we have available in our web shop. We offer knobs in all different sizes, colors and patterns, so we hope you will be able to find one that will match your own personal style and taste.